Few months back, when we were told that FELT is entering India, we had mixed opinion about the brand. On one side, it wasn't like we didn't hear about FELT. We had come across some of their popular bikes in bike magazines. On the other hand, it wasn't like one of those big brands that you keep hearing about all the time. So we wrote to them asking " How do their bikes compare with some of the bigger brands ? The answer we got is "Felt is a smaller company than the larger brands we compete against. The reason Felt is able to compete with the largest companies in the world is because every single employee is passionate about making the best products. The best answer to this question is ride a Felt and then ride another brand of frame at similar price. I have rode a lot of bicycles in my life and Felt truly has magical ride quality. This of course is a short answer and I can go on and on. I really do not like talking about what other companies do I enjoy talking about what Felt does "
Of course, we discarded it as "probable brand talk", but was still keen to ride some of their bikes and find out if there is something really "magical" about them. By then, we have done some googling and realized that the brand has a very rich race legacy. One of the very first bikes Jim Felt ( Founder of FELT bikes) made went on to win the Ironman world championship. Jim was also a triathlete and hence their focus on performance is very high. frame is to have the right balance of stiffness, compliance and weight. The weight part is good, we will soon be finding more about the other two. The frame geometry was on the aggressive side, but there is scope for adjusting the handle bar drop based on the variable adjustable stem (as described later). Cabling is Internal. When Jake Duehring (former Felt sponsored US Track Champion who works for Felt now) was in Hyderabad we had a discussion around the races in which the FR is used. Interestingly, Felt does not have a different bike to race for the classics and uses the FR itself, but with wider tires. Also another interesting thing he mentioned is that the Felt sponsored pros use exactly the same bikes as what is available to the customer ( no custom frames for pros, which means your bike could be same as the pro who wins stage on his FELT roadie) . Fork is made up of Carbon Fibre blades with a carbon dropout. It has a tapered headtube and the headset bearing dimension also varies across the different sizes. The wheels feel very light and strong. The wheels weighed only 2.1 kg (1.2 rear and 0.9 front), which is among the lightest in this price range. The wheels come with 28H (front) and 32H (rear) rims. I was surprised to find this as even with 32 spokes, the rear wheel was very light. The front hubs are ball bearings and rear are sealed cartridge bearings. These are fantastic for training / regular riding. The FR 40 comes with the Shimano Tiagra 2 * 10 speed gears which felt sufficient and worked without any problem. 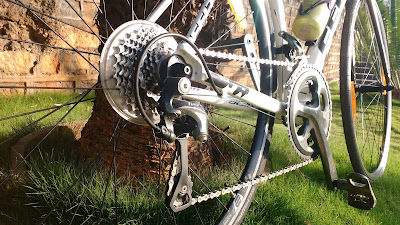 The crankset is Shimano Tiagra as well, and the bike is paired with a shimano tiagra brakeset. The crank is 50/34 and rear cassette is 12/28, providing a gear ratio suited for training and climbing. A quick spin, and I was impressed. Soon enough, I took it for a longer weekend ride. I remember reading somewhere that George Hincapie (former pro rider) had this habit of riding upto the front and asking his teammates to check if the chain was still on as pedaling was so easy. This thought kept coming back to me throughout the ride as that is exactly how the FR feels. Effortless! Shift to a gear where you can maintain a high cadence and the bike feels so light and easy to pedal. That was the first impression. Initially on climbs I found myself shifting to a higher gear than what I generally do and grinding at a very high gear towards the end of the climbs. This could be due to the high level of responsiveness at the lower gears. But once I got used to the gearing it was more easy on the climbs. The bike corners and descends very well. I was very comfortable on the bike during and after the ride as well. Interestingly the FR 40 also absorbs the road vibrations very well. The bike felt very comfortable on village roads and gravel as well. The FR40 is built with the BB386 for additional stiffness and tyre clearance. The handle bar is a variable shaped. The handle bar diameter is wider towards the center (where it clamps on to the stem) and thins out where we hold at the top or drop and hence very comfortable to hold even for people with smaller palms. The bar tape also nicely complements it by being comfortable but not too thick. Its also nice to see the stock bike being paired with quality tires. This is one of the areas most brands cut cost. The FELT website mentions some of the FR series road frame being able to take 28 inch tires, but the stock bike comes with 700x25c tires. The saddle has few spots of gloss finish which makes it a little slippery at times. It does have a small depression in the middle of the saddle to ease out pressure on the nerves. The bike comes with a carbon seatpost. It also has a very useful scale near the place where the saddle rails clamp the seatpost to indicate the saddle tilt. We also like that FELT has not overlooked some of the "usually ignored areas". Examples being high quality bar tapes and good tires . The stem adjust-ability is very thoughtful and is a great feature for beginners. It is a tough race between the performance road bikes with some of the top brands available in India. I would rate the Felt FR bikes to be the best of the lot that I have ridden. It is the best option for a rhythm rider looking for an all round bike. With light and fast wheels, the complete package is very fast and comfortable. Like their technology page describes, it allows you to save on watts on the early stages of a race so that you have more energy left in the tank for the finale. Highly recommended for training, racing and even some endurance riding. The FR 40 is priced at Rs 101050 (and there is a limited period 10% launch discount) and is available in 51 and 54 cm. Gokul has owned and (or) ridden Cannondale CAAD 8, Orbea Aqua, Merida Ride 100, Bergamont Prime 6.4 , Velocite Geos, Fuji Touring, Specialized Allez Sport, Merida Reacto 5000, Merida Scultura 400, Merida Ride 300, Specialized Diverge and a few unnamed Astr Prototypes at different points of time.